Epidemiology: Oral mucosal melanoma is a rare disease world-wide, accounting for only 0.26% of all oral cavity cancers. It makes up < 1% of all melanomas in the United States. The anatomic distribution of melanomas is as follows (according to National Cancer Database Report on Cutaneous and Noncutaneous Melanoma): cutaneous 91.2%; ocular 5.2%; mucosal 1.3%; and unknown primaries 2.2%. This data is derived from 84,836 cases of melanoma diagnosed in the US between 1985 and 1994. More than 50% of mucosal melanomas occur in the head and neck region, including the oral cavity and sinonasal region. The remainder involve urogenital and anorectal mucosae. Mucosal melanomas are much more aggressive than their cutaneous counterparts and are not related to sun exposure. Molecular Genetics: Mucosal melanomas show frequent alterations in the KIT gene which encodes a receptor tyrosine kinase that interacts with Ras in the Ras/Raf/MEK/MAPK and PI3K/AKT signaling pathways. Clinical Features: Most oral melanomas are of acral lentiginous melanoma subtype. The age group usually affected is 5th to 7th decades of life with a male predilection. About 70% to 80% of lesions are found on hard palate or maxillary alveolus. Early lesions (in-situ) appear as brown to black macule with irregular borders. More advanced lesions are characterized by nodular invasive growth phase and present as soft, exophytic lobulated mass. About 10% of oral melanomas are amelanotic and may show normal pink-tan color or a vascular appearance. Advanced cases may show ulceration accompanied by pain. Plain radiographs may show irregular destruction or moth-eaten appearance in the adjoining bone. Cervical lymph nodes may be palpable at presentation. Clinical History: This elderly female presented with a 6-month history of pain and swelling in her lower jaw and loss of several teeth over last three months. 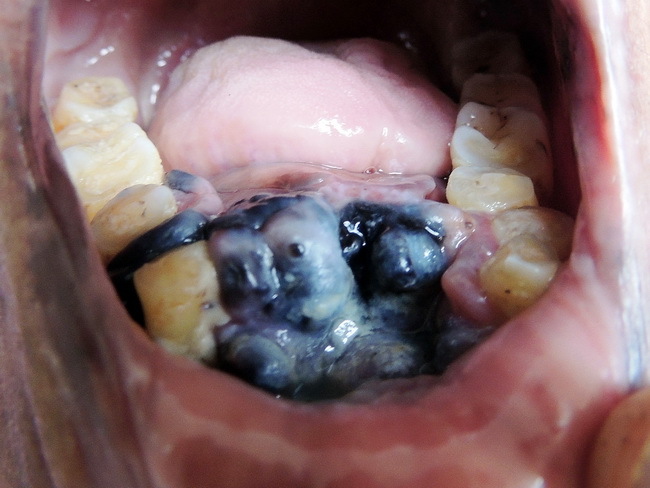 On intraoral examination, there was a black colored, hard, multinodular tumor on the anterior gingival margin of the mandible measuring 4 cm in greatest dimension. The central mandibular incisors were absent. A biopsy of the mass confirmed the diagnosis of malignant melanoma.